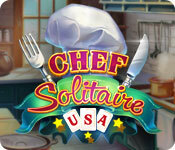 Chef Solitaire: USA is rated 4.1 out of 5 by 26. 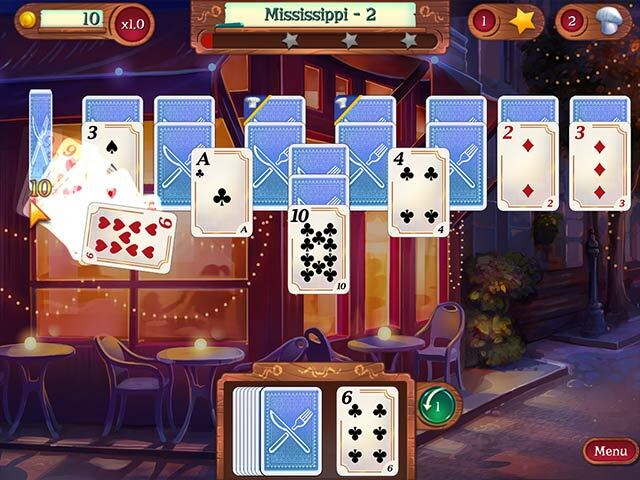 Rated 5 out of 5 by flyawayfaye22 from Sweet & Savory Solitaire MUST OWN higher/lower Solitaire Game! Gorgeous graphics, a cute story, and 48 states of solitaire levels each with 10 levels so..... 480 levels! Not to mention the play is regularly broken up with a few fun mini-games that can also be played separately. Seriously - you need this game. Rated 5 out of 5 by mary102696 from Made me a believer! I have not purchased many solitaire games but this one grabbed me as soon as I started playing. There is even a cooking mini game. The flow is really good and it started getting really challenging during the third location. I am very glad I purchased. Rated 5 out of 5 by phooofeee from Just Plain Fun! I thought this game would be boring--but it's pretty fun! Love the variety of the music and of the game and mini-games. Pretty simple mini-games (geared toward the youngsters) The game goes on FOREVER, 10 levels for each of 48 states...not sure why they left out Hawaii and Alaska! The graphics are generic and not specific to each state, except for the state flag. Might have been nice to have some educational information about each state, or maybe even some foods that might be found in restaurants in the states, etc. But, I just find this game pleasant and fun! Rated 5 out of 5 by mrm2006 from Travel across the US in a fun soitaire game! Stacy's bookstore is doing badly and must close down. She will have enough money to open the restaurant of her dreams. How well will she do???? Graphics are cute. Exactly what you'd expect in a fun game. Music was great ..... wanted to get up and dance - lmao. Voice overs were a surprise and Stacy's voice was en point. 3 levels of difficulty: Casual, Normal and Hard (or is it Expert????) This is a typical high/low solitaire game that has a lot to offer. From the imaginative restaurant backgrounds to having to find items during game play to mini games between 'x' number of levels .... it does not disappoint. You can earn up to 3 stars per hand. Each 'state' that you go to, to open a new restaurant, requires 'x' number of stars so be prepared to replay hands where you haven't reached that achievement. Oh yes!!! There ARE achievements to be earned as well! Will I purchase it? Ultimately .... at some point. I have soooooooooooo many other solitaire games to get through first! lol An amusing and entertaing solitaire game that is great for all levels of expertise. Come along and join me 'playing' through the US and ................... ENJOY! Rated 5 out of 5 by margot01 from A very nice solitaire game This is a really good solitaire game. Nice (skippable) minigames. The stars you can earn each level are actually functional, because they are needed to buy your next restaurant in the next State. At your fourth restaurant you can buy a wildcard, wich is a bit to late in my opinion because some levels before that it took me about 15 plays to win those levels. Besides that I like it a lot. Rated 5 out of 5 by ecblisa from The solitaire game I've been waiting for! Not only is this game lots of fun to play (including nice mini-games that pop up suddenly), but it offers great play for both beginners and advanced players (including experienced klutzes like me). Settings vary from very forgiving to very challenging, So many solitaire games are totally unforgiving of losses, and demand endless replay of levels for forward movement. This one lets even us challenged users move on without too much trauma. I really recommend a trial! Rated 5 out of 5 by pennmom36 from Solitaire In 48 States! 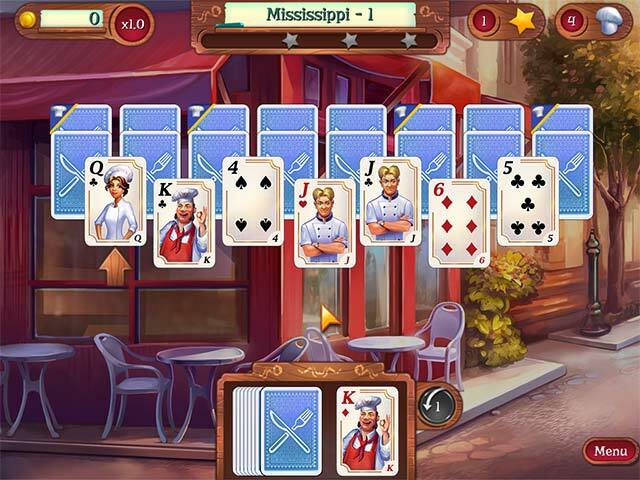 Open up restaurants in 48 States, Solitaire style! This is a Higher/Lower type solitaire where cards can be played either one higher or one lower regardless of suit, however, if you play cards of the same suit, you get bonus points to fill the star meter quicker. There are only 4 styles of cards and 3 different face cards available, but there are Achievements to earn and there are bonus games available, Freeplay Solitaire, Tri-peaks Solitaire and Five Peaks Solitaire. There are three modes of difficulty, Casual which has a higher chance of receiving special cards, higher points are awarded and you can play cards from Ace to King and vice versa. Medium mode gives you a medium chance of receiving special cards and the points you receive are normal points, Ace to King and vice versa still applies. In Hard mode, there is a low chance of receiving special cards AND the Chef cards are harder to get to, Ace to King and vice versa does not apply. Everything in this game is related to a restaurant theme, so some of the cards are covered with Bacon that require you to uncover the tongs card, and some cards are covered with fried eggs that require finding the spatula card other cards are covered in Grease that requires you to find the cleaner card, you get the picture, kinda creative if you think about it. The goal in each game is to remove all Chef Cards, some other goals are occasionally given such as making a large combo. Unless you go into settings and opt out of the AUTO FINISH feature, the game will end when the level goals have been met, even if cards remain on the board. If you don't complete the level goals, and runout of cards, you will have to replay the level until you do . The money you earn can be used in the shop to purchase Kitchen themed items such as a Mixer that will show you how many cards are left in the deck. Some of the cards are Special cards that give you a Mini Game to play for extra points, (they can be skipped) There are two different ones in the demo, Burger Run and Leaky Pipes. 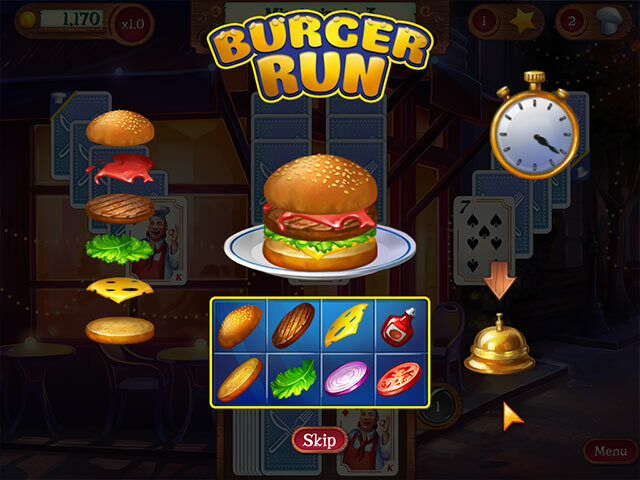 Burger run is a fast paced game where you assemble as many burgers as possible before the timer runs out, with the same ingredients as shown on the left, and more ingredients are added as you progress. The pipes game is the same principle using different angled pipes to stop the leaks. After yesterday's solitaire disaster of a game, this game has come to the rescue of all solitaire fans, enjoy!